Subepithelial tumors (SET) of the gastrointestinal (GI) tract are detected in 0.3–0.5% of routine upper GI endoscopies. Often a surveillance strategy is chosen for asymptomatic SET of moderate size (<2 cm) in the GI tract. In East Asia, surgical oncologists more often prefer resection to surveillance of SET, sometimes using minimally invasive endoscopic techniques. Minimally invasive endoscopic or laparoscopic resection techniques have become very efficient in specialized centers. 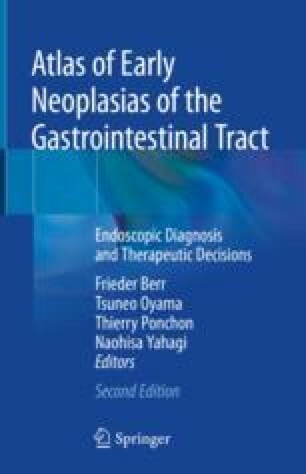 This chapter discusses surveillance or resection strategy but is not a review of gastrointestinal SET. The contribution of cases and histology by Drs. Tsuneo Oyama, Nagano, Takashi Toyonaga, Kobe, Japan, Hans P. Allgaier/Freiburg, Gerhard Kleber/Aalen, Germany, and Daniel Neureiter/Salzburg, Austria is gratefully acknowledged.